Today we celebrated Mass in the hall on the feast day of St. Faustina Kowalska. 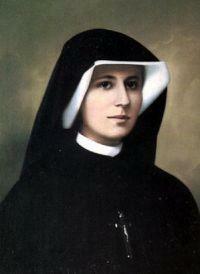 St. Faustina was born in Poland and was the third of ten children. At the age of 20, she became a nun and was named as Sister Maria Faustina. Even from her earliest childhood, Faustina desired to become a saint, and she offered her life as a sacrifice for poor sinners. Due to this, God gave her the grace of much suffering, as well as numerous mystical graces. Jesus said to Sister Faustina, “In the Old Covenant I sent prophets to my people. Today I am sending you with My mercy to the people of the whole world. I do not want to punish mankind, but I desire to heal it. Following her immense suffering, Sister Faustina died October 5, 1938 at the young age of 33, the same age as our Lord when He died. In 1993 Pope John Paul II said, “God has spoken to us through Sister Faustina. She left to the world the great message of Divine Mercy.